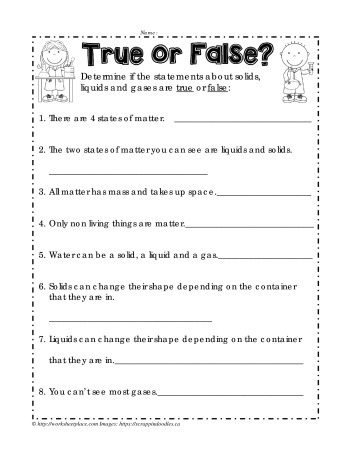 A true and false matter test for 2nd grade. The two states of matter you can see are liquids and solids. True, you can?t see most gases. All matter has mass and takes up space. True?think of air that takes up space in a tire. Only non living things are matter. False Living and non living are matter. Solids can change their shape depending on the container that they are in. You can?t see most gases. True, most but not all gases are invisible.